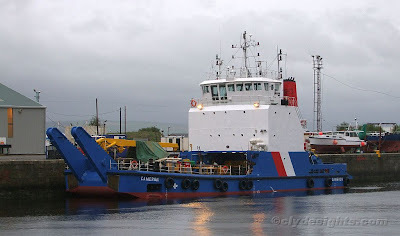 Also seen in the James Watt Dock was Briggs Marine's CAMERON, fresh from a recent docking in the adjacent Garvel drydock. During the afternoon, CAMERON had been at Faslane, having just left drydock earlier in the day. Previously, CAMERON had retained the buff upperworks and black hull of her original owners, the Royal Maritime Auxiliary Service, but whilst in dock was repainted into her present owner's more colourful livery. I actually like CAMERON's new colour scheme.